Storyline: What does a day in the life of wombat looks like? Well, let’s read the diary of Mothball, the wombat. It looks like on Monday all it did was sleep, eat grass, scratch itchy spots and sleep some more. Even though Tuesday and Wednesday it did the same things, with an occasional dust bath, the wombat from our story actually had some fun. Wondering around, he stumbled across some humans that were cooking hotdogs on a grill. He wasn’t impressed by either the hotdogs or the humans, but he found a dust rug that he fought with, mistaking it for a flat hairy creature. Humans gave him a carrot and he liked it very much. By evening, he was waiting at the front door, demanding more carrots. But since no one answered him, he chewed a hole in the door. That got people attention and they came out with the demanded carrots very fast. The next day, he decides to stick around this new place discovering that he can scratch his back better against the garden furniture. At dinner, when there were no carrots for him and the hole in the door was patched, he banged the garbage bin until the humans got the message and came out with the carrots. Though it looked like a nuisance, digging holes all over, eating the groceries from the back seat of the car and knocking down the laundry in the back yard, the family seemed to tolerate the intruder. But the wombat wasn’t so nice. He thought that humans are dumb when the carrots don’t come right when he demands them and, as a punishment (or just to make himself clear), he damaged people’s stuff and made a mess everywhere. When, after a few days, he got rolled oats instead of carrots (probably depleted by now) he liked it so much that he decided to permanently move in and dug a hole under the house. The end. He is quite a nuisance but people don’t seem to mind. The wombat, on the other side, has a bad opinion about humans. Illustration: Bruce Whatley has a clear brush on this book. The illustration is big, bold, doubtless, with the wombat getting the prominent position on the page. There are very few details, just enough to give every page its special meaning and enhance the writing. As the story goes further, so the illustration, showing us what the author has omitted. 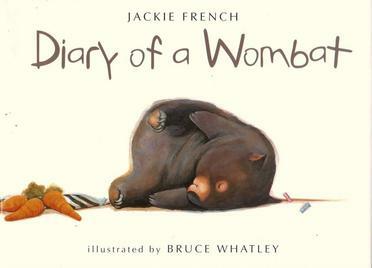 And the main character, the wombat, is rather cute.